Fire pumps from Australian Pump Industries are being rushed to homeowners in Tasmania to help them save their property from the unexpected catastrophic fires sweeping the state. The Hobart-based authorised Aussie Pump distributor, Brierley Hose took emergency action, pulling in stocks of Aussie fire pumps and firefighting hose kits by express transport. 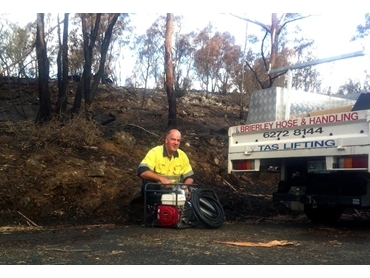 Brierley Hose handles the full range of Aussie Pump’s top quality petrol and diesel drive fire and transfer pumps. John Brierley explains that they chose the Aussie Pump range because the products are simply better than other pumps in terms of performance, durability, warranty and price. The Fire Chief, a highly popular model is a purpose-designed portable high pressure fire fighting pump that comes with a powerful Honda 5.5hp industrial petrol engine in its standard version. Backed by Honda’s 3-year warranty program, the engine is supported by Honda dealers throughout Australia for in- and out-of-warranty service.